It’s been an explosive start for the Crested Butte Titans girls soccer team, rattling off three shutout wins in a row, including a recent 2-0 win over the Ridgway Demons. 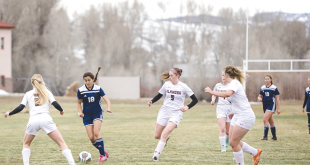 The Titans’ first two wins were relatively easy as they cruised past Cortez and Ignacio, but coach Julia Kidd and her team knew Ridgway would be a tougher test when they faced them on Tuesday, March 20. Given the history between the two teams, the Titans struggled to establish any momentum in the opening minutes of the game as both teams spent much of the play trying to figure each other out. After an erratic opening 15 minutes from both teams, the Titans struck as Maya Schaeffer took a pass outside the 18-yard box and blasted a shot past the unsuspecting Demon keeper. With both teams pressed high, much of the game in the first half was played in the middle third of the field with the random breakaways erupting. 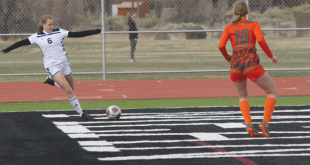 The Demons looked to play the ball over the top and run onto it but sweeper Siena Truex and the back line were well-organized and goalie Rachael Potoker was quick off of her line to clear any additional threats. The Titans carried their 1-0 lead into the second half and continued to settle into their game for the final 40 minutes, using the one-goal advantage to build their momentum. “That goal gave us a leg up and some comfort to settle down,” says Kidd. The Titans struck again in the seventh minute of the second half when a shot from Hazie McNellis stunned both the Ridgway defense and their goalie and trickled in for a 2-0 Titans lead. In the end, that was all the Titans needed as they continued to handcuff the Demon attack and hold on for the 2-0 win to remain undefeated with their third clean sheet in a row. “Our defense is really figuring each other out and how to work together, and having Rachael in net for that game was very important,” says Kidd. The Titans have a big week now as they meet ski town rival Telluride on Saturday, March 31. They follow that up with a game against Alamosa on Monday, April 2. “It’s going to be a tough week,” says Kidd.